For the past year I have lived with our wood cabinets, trying to appreciate their natural beauty. 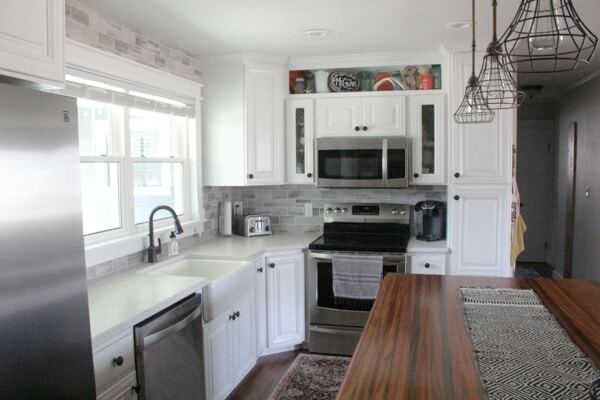 Even though wood cabinets are loved by many, I love the crisp bright white look of painted cabinets. After a whole year, I knew it was finally time to spray paint the cabinets. 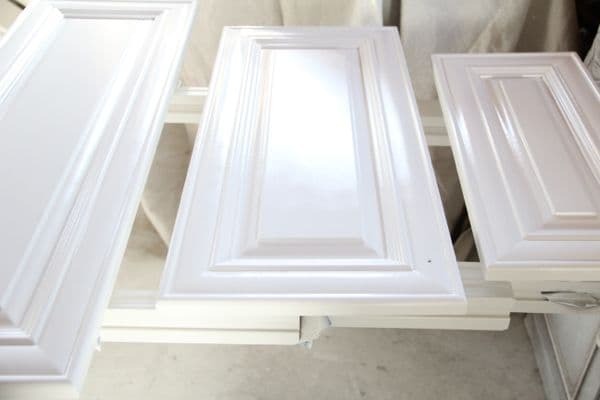 In order for the cabinets to look like they had a professional finish, I knew I needed to spray them. 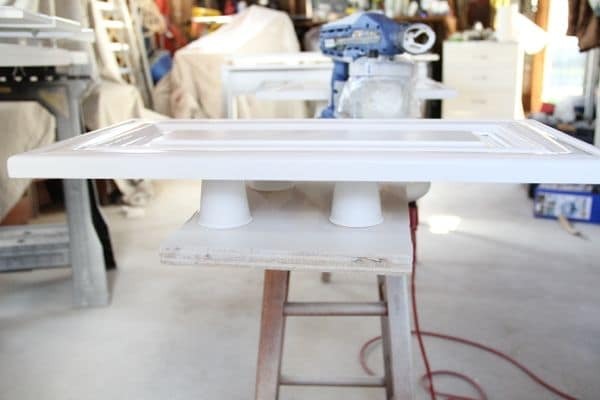 I wasn’t looking forward to taping off every inch of my kitchen and appliances like all of the bloggers did in these cabinet painting tutorials. 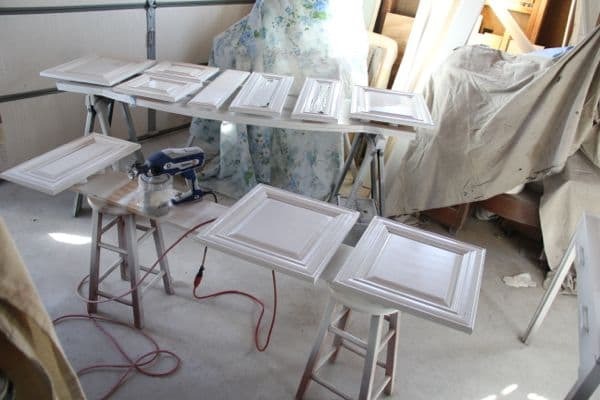 So I decided that I would roll and hand brush the cabinet bases, and spray the doors in the garage. 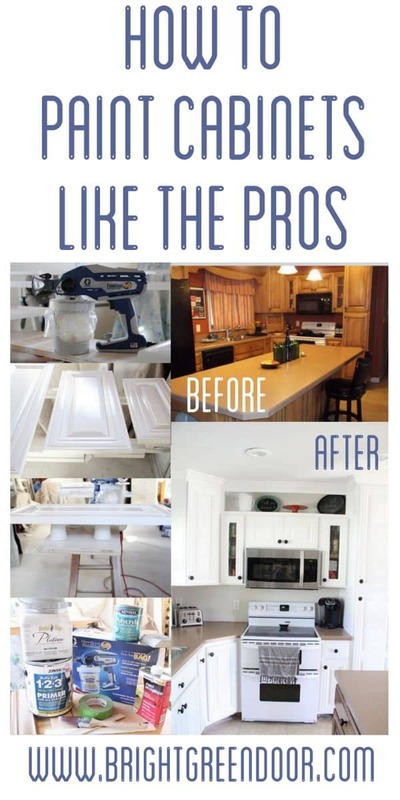 After completing the project I will tell you that this is absolutely the best way to get a professional finish, without spending your entire life prepping and taping off your kitchen. I started by scrubbing every cabinet with deglosser and a scrub pad. Then I used Zinsser 123 Bulls Eye Primer with a small roller and a fine paintbrush. Next up I used 3 coats of Benjamin Moore White Snow in Dutch Boy Advance Semi-Gloss. 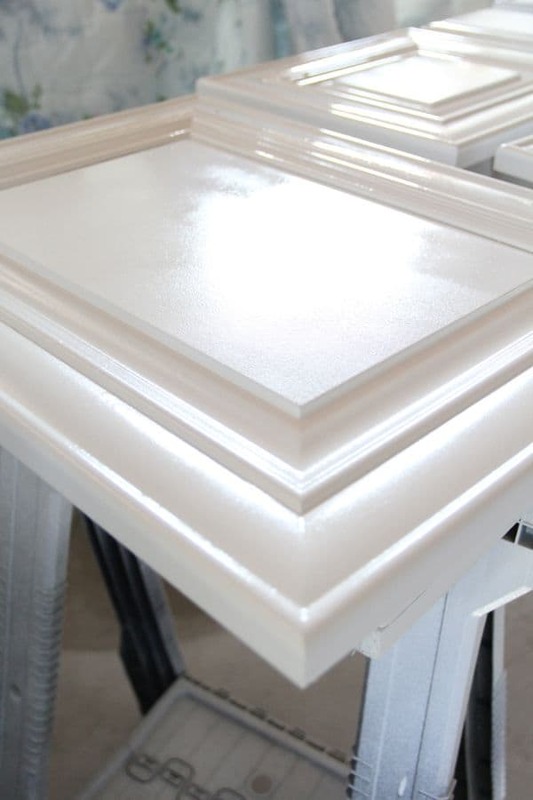 Then I sealed them with three coats of Minwax Polycrylic. 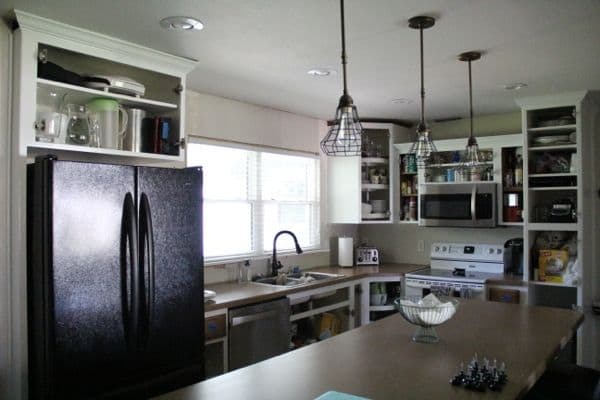 I’ve used Rustoleum’s “Cabinet Transformations” kit once, I created my own “DIY Cabinet Transformations” kit once, and now used these paints, and this is the happiest I have been with how my finished has turned out. It was a time-consuming process, but I still think it was better than taping off everything. Next came the cabinet faces. I set them all up in the garage, and threw drop cloths over everything that I didn’t want a coat of white paint on. 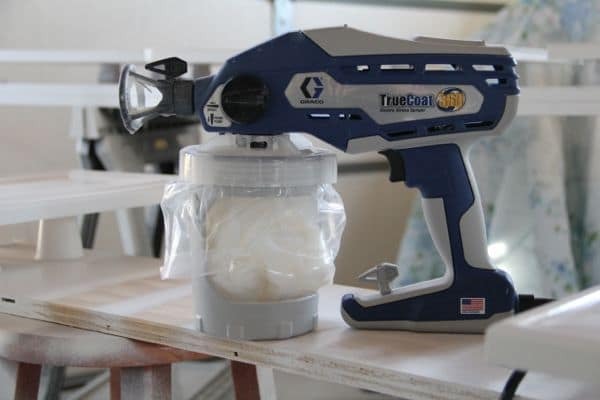 I used the Graco TrueCoat 360 paint sprayer and couldn’t love it any more. Seriously, this not a sponsored post, but I HIGHLY recommend you do not spray paint cabinets without this sprayer. After using a Wagner and now this, I can tell you without a doubt this is the BEST sprayer out there. 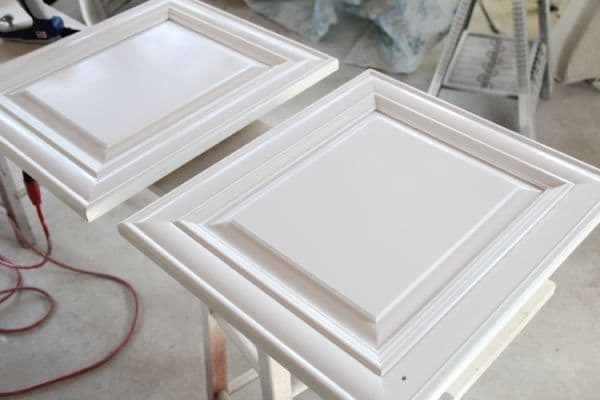 Another tip I have is to use Dixie Cups to raise up your cabinets from the table so that you don’t get any paint lines or sticking. 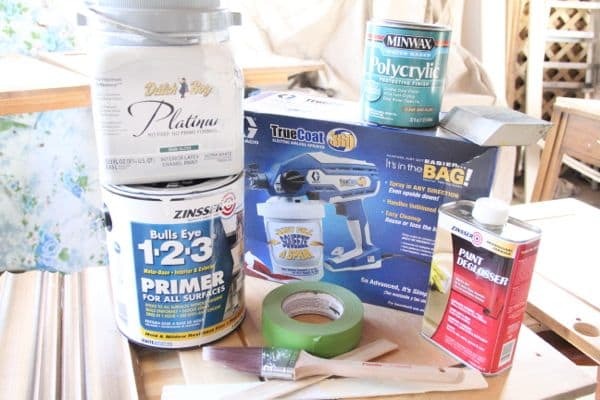 It’s so simple but so easy, and way cheaper than those little paint pyramids that you can buy. 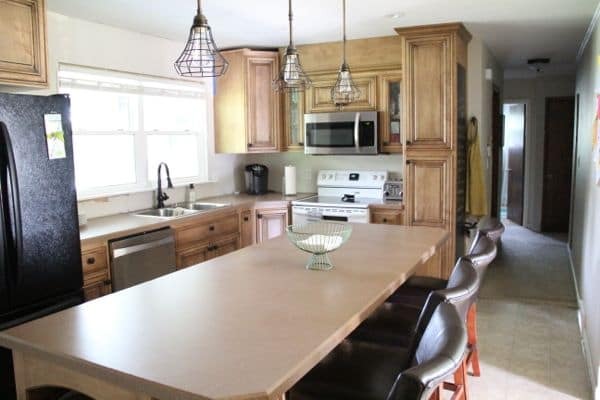 It’s really hard to capture the smooth finish, but I am amazed with how crisp and professional the cabinets look. Overall it took about a week to do the entire project including dry time. The nice part about using the sprayer is that each coat took less than 5 minutes! Cleaning the sprayer is also about a 5 minute job, so every few hours I’d put on my painting clothes, spray a coat, clean the sprayer, and wait a few hours to do it all over again. Once it was all done here is the finished product! Don’t they look amazing!? 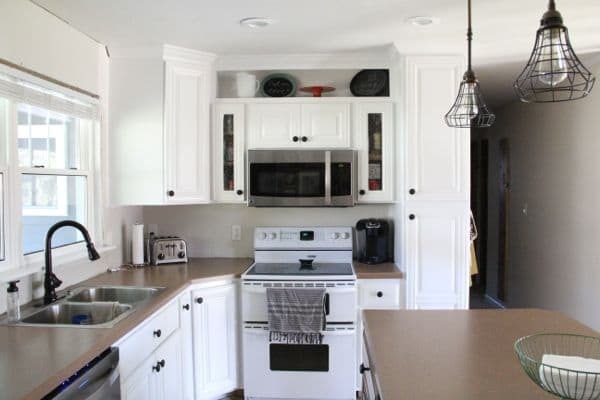 On Monday I’ll be back to share how I built that open shelving cabinet above the microwave! In the mean time check out what the kitchen looked like exactly one year ago when we started this Auction House Adventure! 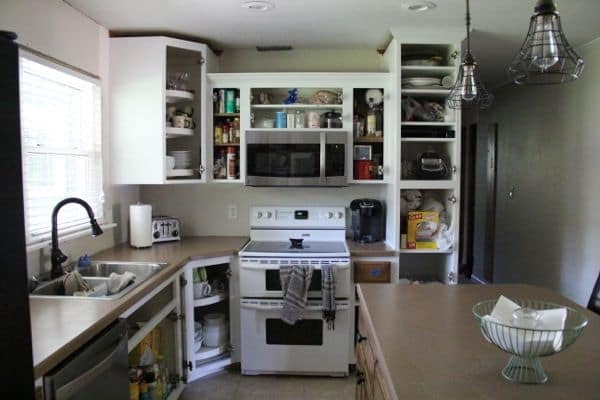 Red walls, Wood apron over the sink, Tiny window, Corner Appliance Garage, Rusty old faucet, and Dirty small Knobs. We’ve come a long ways huh?! 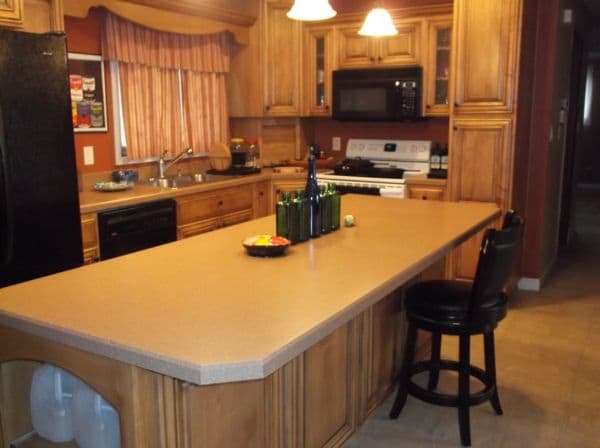 3/11/15 Update- Since painting the cabinets we updated the appliances affordably, replaced the island with a wood counter, added a farmhouse sink, and replaced the counters and backsplash. Here is the finished product now! 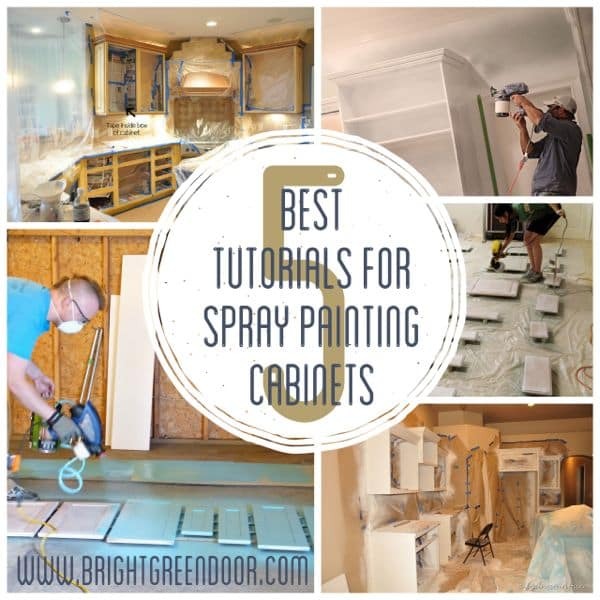 If you’re considering spray painting your cabinets and want some more great tips and tutorials, check out the Best Tutorials for Spray Painting Cabinets! « How to Make Restaurant Style Chicken Parmesan at home! In the article it says you used semi gloss paint, but in your comments it says you used satin?